Now isn't that the question of the day. Or at least it was for Grandma J. 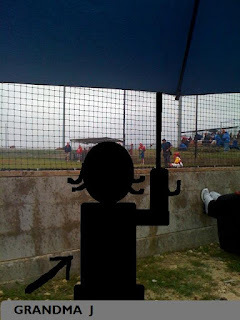 When A-Ron has a baseball game and it rains.....the game goes on! That's the way it is here in Texas. The umpire doesn't call the game unless there is lightning. The players make a point of sliding in the wet red clay. It's an Oxy Clean day! Grandma J bought a really nice collapsable chair last year. 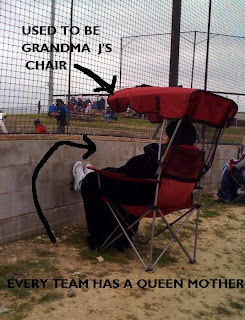 She bought it specifically for occasions like ball games so she wouldn't have to sit on alluminum bleachers. More specifically, she bought one with a canopy to block the hot sun in the summer and the wind and rain when Mother Nature was on a rampage. Boy do I recognize that chair! Someone thought it was theirs because it was in the back of their Tahoe. Queenie doesn't No one budges!! Luckily there was an umbrella handy. And that's how it was....alluminum bleachers and all. Do you have similar rules of possession in your family? If it were my chair I'd wrestle her for it. That goes for their stuff too. You should try that logic. Yes, we do, but the rules apply mostly to our bed - and NOT in a sexual way! Most of that bed belongs to me because I get there first and claim it. So sorry, Checkered, that you must sleep every night on the little edge. Our cat owns everything at our house. We just get to use things as she sees fit. Time to buy another chair, GrandmaJ! We pretty much share everything around here, too. There are different rules for different situations. I think this one needs to go to Judge Judy, who I'm very confident would rule in Grandma J's favor. I love that chair! Our rule of possession mostly applies to laundry, he who finds it owns it. Dollars, quarters, chapsticks, and whatnots. I LOVE laundry. But every once in awhile, I get smoked by someone getting a $5 out of my pocket and it stings. Yeah but everybody gets up eventaully for some reason you know ..and then all bets are off!